Dr. Vivek A. Saoji, MBBS, M.S. (Surgery) is an alumnus of Indira Gandhi Medical College, Nagpur. After obtaining the M.S. Surgery, degree he joined the Tata Memorial Hospital for his advances training in Oncosurgery, Dr. Saoji joined Bharati Vidyapeeth Medical College in December 1990 as Lecturer & went on to become Professor & HOD in the year 2000. 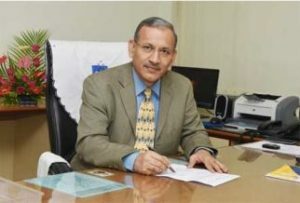 He was Vice – Principal of the medical college from March 2001 to July 2007 and then the Dean/Principal for a period of 10 years from July 2007 to July 2017. He was awarded the FAIMER Institute fellowship in year 2003-04 for training in medical education at Philadelphia, USA. Subsequently he was also awarded the International Fellowship in Medical Education (IFME) by ECFMG for pursuing his master in Medical Education (MHPE) at the prestigious Department of Medical Education University of Illinois at Chicago, USA. Dr. Saoji is extensively trained in Medical Education and Leadership. He is known nationally & internationally for his work in Medical Education. He is invited as key resource person / faculty in various conferences, workshops, CME’s etc. He is invited as a faculty at all the three FAIMER Regional Institutes in India. He has immensely contributed to further the cause of Medical Education in the Country. Member, Governing Council, Indian Council of Medical Research (ICMR) New Delhi. Empanelled as Expert (Peer Committee Member) National Assessment and Accreditation Council (NAAC) Bangalore. Empanelled as Expert for Faculty Development, National Board of Examination (NBE), New Delhi. Member, BOS, JSS University, Mysuru. Member, Ad-hoc BOS Medical Education, Maharashtra University of Health Sciences (MUHS) Nashik. Member, Planning and Monitoring Board, BLDEA University, Bijapur. Outside Expert, Department of Medical Education Sri. Devraj Urs University, Kolar, Karnataka. Professor – 17 years Actively involved in teaching surgery at UG and PG level for 27 and 21 years respectively. Registrar in General Surgery at IGMC, Nagpur. Trained in Surgical Oncology at Tata Memorial Hospital, Mumbai. Unit I/C, Professor & HOD for more than 10 years. Actively involved in research activities. So far successfully guided Nine PG students. Successfully completed six Research Projects in Surgery and Number of educational projects in Medical Education. Principal, Bharati Vidyapeeth Deemed University Medical College, Pune, July, 2007-17. Dean, Faculty of Medical Sciences Bharati Vidyapeeth Deemed University, Pune, 2005-12. Vice-Principal, Bharati Vidyapeeth Deemed University Medical College, Pune, 2008-12. Chairman, Scientific Advisory Committee, Bharati Vidyapeeth Deemed University Medical College, Pune – 2008-12. Chairman, Medical Education Unit, Bharati Vidyapeeth Deemed University Medical College, Pune. Trained in Medical Education as Fellow FAIMER – Institute Philadelphia 2003-2004. Recipient of International Fellowship in Medical Education (IFME) in May 2006 for pursuing Master’s Degree in Medical Education (MHPE) at the University of Illinois at Chicago, USA. Invited as Member for meeting of Directors and Faculty of FAIMER Regional Institutes (DAFFRI) in August 2007. Invited as Faculty Advisor (FA) for the FAIMER Institute Philadelphia in October 2007. Invited as Faculty at the three FAIMER Regional Institutes at Mumbai, Ludhiana and Coimbatore. Invited as Faculty / Guest Speaker at NCME, Delhi, NCHPE, Pune, Vellore, Coimbatore, Sevagram, Mumbai and International Conference on Medical Education, Bangalore (2007). Invited as Guest speaker to deliver a CME lecture at ASICON 2008 in Ludhiana. Guest speaker / Chairperson in various State / National Surgery Conferences / Workshops. Participated as faculty for Advanced MET workshops at MUHS – Pune Regional Centre. Participated in all Deans Consortium Meeting organized by MUHS – Pune Regional Centre. Attended all ME related activities of MUHS – Pune Regional Centre. Other responsibility related to education – UG/PG/MEU/BOS Member, etc. UG, PG Teacher and Research Guide. Member and Chairman, Board of Studies in Surgery of Bharati Vidyapeeth Deemed University, Pune since 2000. Member, Board of Studies in Surgery MUHS, Nasik 5 years. Dean, Faculty of Medical Sciences, Bharati Vidyapeeth Deemed University Medical College, Pune from 2005-12. Member, Board of Management, Bharati Vidyapeeth Deemed University 2008-10. D.Y.Patil Medical College, Pimpri, Pune. Krishna Institute of Medical Sciences, Karad. KLEU’s Jawaharlal Nehru Medical College, Belagavi. MGM Medical College Navi Mumbai and Aurangabad. Datta Meghe Institute of Medical Sciences, Deemed University, Nagpur. At Medical Council of India – Regional and National Conference to commemorate the Golden Jubilee celebrations of Medical Council of India, New Delhi.